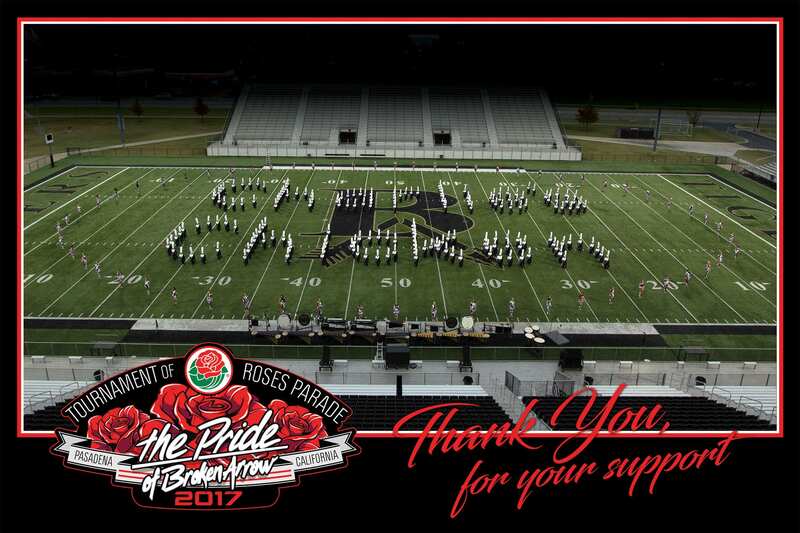 The Take the Field with the Pride program is a benefit for our Gold Level and above sponsors that recognizes them for their support of Broken Arrow Bands while also spreading recognition of our program. We set aside a practice during the season to produce photos where our members spell out the name of the sponsor or their company. Most of them hang them in their entrances or elsewhere in their business to show their support to the community, and that display also spreads the recognition of our program to people who might not otherwise be exposed to it. 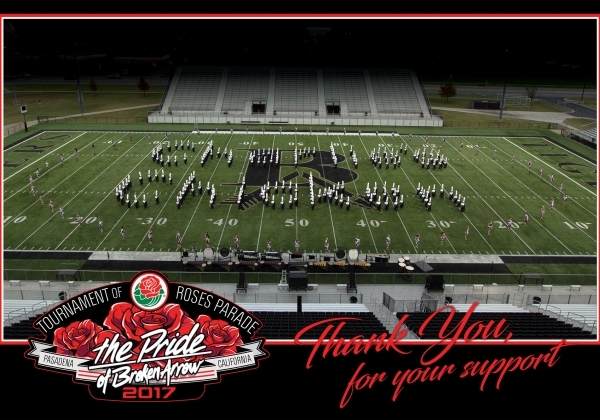 Sponsors also receive other benefits, including recognition as “Gold Plus Sponsor” in all program books for events each year they remain a supporter; name, logo and website linked through www.brokenarrowpride.com; an ad listed in Broken Arrow Community Calendar; a full page ad in Drums of Summer & Broken Arrow Invitational program books; tickets to Drums of Summer & Broken Arrow Invitational; and being announced as sponsor for Pre-Game field entry at all home football games. The main audience is our sponsors, with the wider Broken Arrow community as a secondary audience. The budget is used for printing the posters, framing them and delivery charges when applicable. The qualifying sponsors make donations of at least $1,500, and the budget varies year to year based on the number of sponsors at that level, but the money spent for each poster is a small fraction of the donation to the program. 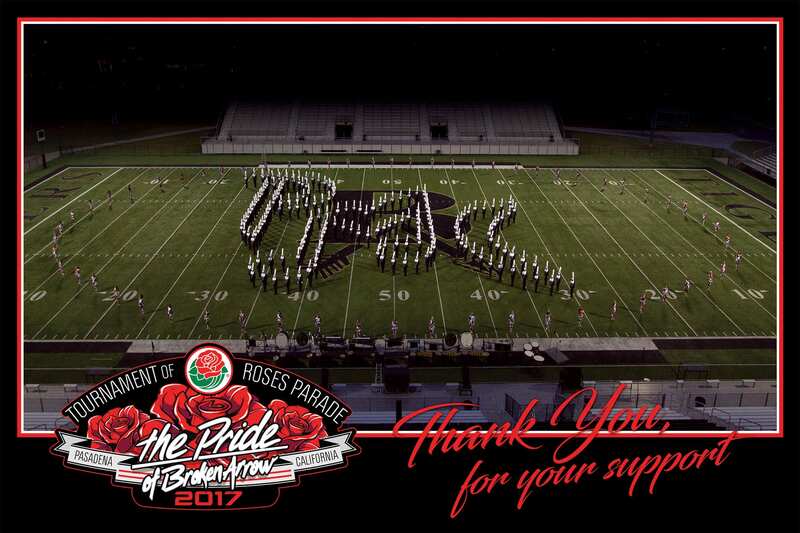 We recently did special posters to recognize the sponsors for our Rose Parade trip. We measured the success by the feedback from our sponsors, which was very positive. We also went back to several after they received their framed posters to touch base with them and see if they were displaying their posters to help to determine if it was a worthwhile effort. This is an easy way to recognize your sponsors and let them tell to the community that they are proud supporters of your program.